A place for food, health, green ideas, and living a happy life. I’ve been on the crunchy lifestyle bandwagon for a while now. My mission to live a sustainable lifestyle has taken some unexpected turns. One of my favorite things to do has been replacing my beauty items with sustainable, homemade versions. In fact, I have a batch of homemade body butter cooling in the kitchen right now. I’ve tried the so-called “no-poo” method (i.e. baking soda and water as a replacement for shampoo). Can I just take a moment to say what a horrible name that is!?! Okay, end rant. I tried the standard baking soda and water shampoo replacement method. Long story short, for whatever reason, this method did not work for me. I can’t pin the failure on the water, my hair type or the environment, or just the plain fact that it doesn’t work. My hair just felt thick and dirty, never that fresh and clean feeling. However, my fellow sustainable bloggers swear by it. It just did not work for me. This failure spurred a desire to fix it. I could not simply go back to shampoo. I had to find some answer to a healthier method to cleanse my hair than the chemical-laden cocktail that was sold at the store. Organic versions are better, yet expensive and still don’t fix the problem of using detergent on my hair. It’s unnecessary. Before 1930, we didn’t even have what we now know as shampoo. I have now been washing my hair with my “compromise” method for a few months. To be perfectly honest, I was skeptical and not sure if I would stick this one out. I think the method I have designed is a nice compromise between using organic shampoo and the baking soda method. This method does take some getting used to. You will more than likely go through a bit of a greasy phase. If you experience this, have no fear, there is a natural dry shampoo method found here. Use this dry shampoo during the transition phase. Fill and 8 ounce squeezable bottle with water, leaving some room at the top. 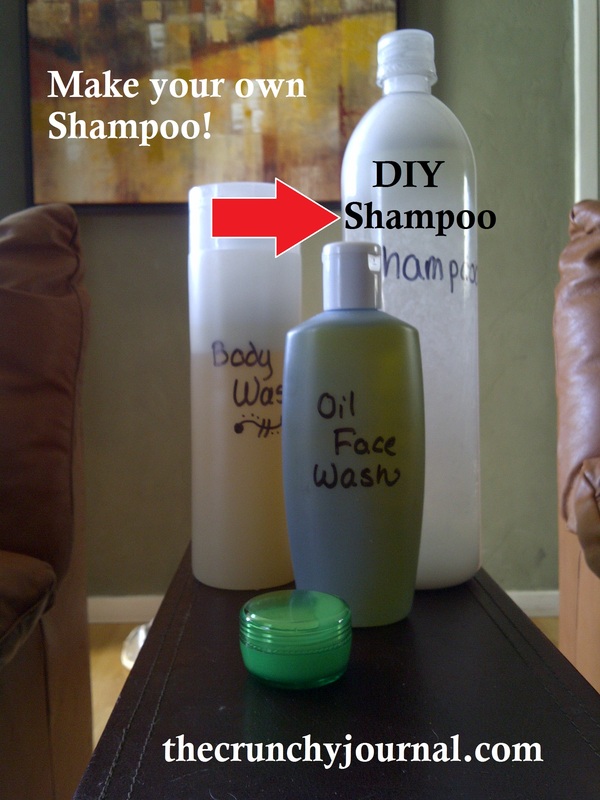 You can also re-use an old shampoo bottle or any other suitable container. Add 1 teaspoon of baking soda. Add 1 teaspoon of organic shampoo. I use this kind. Add 1/2 teaspoon of sea salt. Then, rinse while massaging my scalp. I’m still working on an alternative to conditioner … so stay tuned. I then use my homemade body wash.
Let me know how this works for you! Everyone’s hair is different, so tweak the recipe as needed. Until next time, I send you peace, love, and good energy. Hi, my name is Sharon and I am a young legal professional developing practical ways to live “green” and healthy on a busy schedule. In my free time, I research ways to implement simple and creative “green” practices into my busy schedule. So far, I have started a small organic garden and started making my own natural household products. Welcome to my little space on the internet that I've designed to be a place for health, food, and happiness. How to Make Your Own Organic Kale Chips! DIY All-Natural 5 Minute Body Wash!!! Vintage finds and vintage inspired handmade. I am making the switch from vegetarian to vegan - come with me on this journey of food, health, and fitness. About single motherhood, and the adventure into crunchyland. Love for your Organic Child.